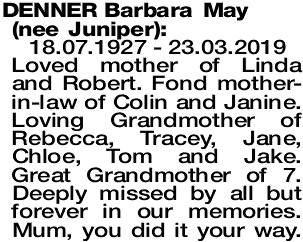 18.07.1927 - 23.03.2019 Loved mother of Linda and Robert. Fond mother- in-law of Colin and Janine. Loving Grandmother of Rebecca, Tracey, Jane, Chloe, Tom and Jake. Great Grandmother of 7. Deeply missed by all but forever in our memories. Mum, you did it your way. A Private Cremation will take place for our mother, Barbara, according to her wishes. A Celebration of her Life will be at Mt Eliza House, Fraser Avenue, Kings Park on SATURDAY (06.04.2019) commencing at 3.00pm. All family and friends are welcome. Dear friend of Jeano, Arthur (dec). Loving memories Barb. 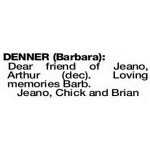 DENNER BARBARA Dear friend of Betty (dec) and Vic (dec). Thoughts are with Linda, Robert and their families.